The idea of a jazz-dance musical version of Romeo and Juliet may sound a little weird, but in the hands of theater-dance company COLLIDE Theatrical Dance Company, I wasn't worried. A new company, they presented two original pieces last year, Lot of Living to Do (set in a 1930s brothel) and The Belmont Hotel (about bootleggers in the late 20s). Both of these told the story entirely through dance (with the help of a short explanation in the program), accompanied by a live band and vocalists. 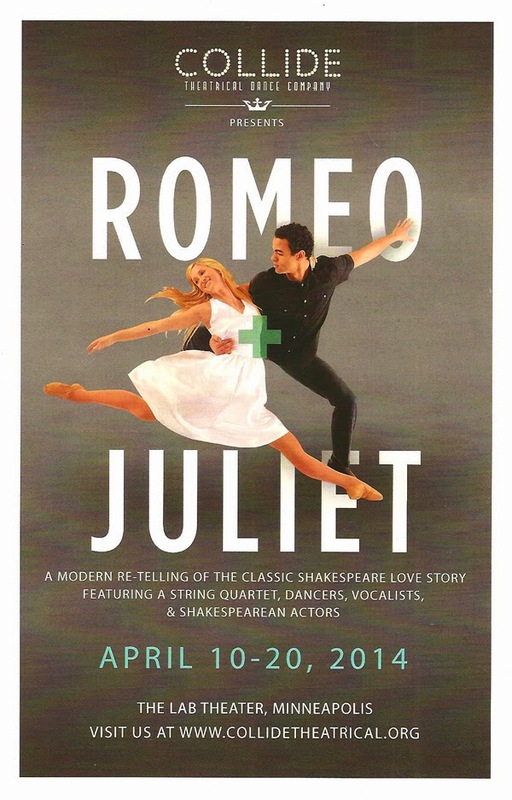 For Romeo and Juliet, some of Shakespeare's original text is included, interspersed with scenes told by dance alone. While I don't think all of it worked, the choreography by Artistic Director Regina Peluso is fantastic and beautifully executed by the eleven dancers, who successfully convey the emotions of the iconic story through music. In a note in the program, Regina explains that the piece is inspired not only by the original play but also Baz Luhrman's movie and West Side Story, which placed Shakespeare's tale in a 1950s gang war. Of the three pieces, I am most familiar with West Side Story, which brilliantly told the story through Jerome Robbins' choreography, so that's where I saw the most similarities. This version mostly follows the original plot but sets the story in 2005 Brooklyn, with characters dressed in modern clothes and texting on flip phones (I finally know why Romeo never got the message from the Friar about the plan to have Juliet fake her death - no cell service). The music is comprised of pop songs played by a string quartet, upright base, and percussion. Two narrator/vocalists (Sasha Andreev and Emily Grodziak) occasionally sing along and also play characters (Officer Krupke/the Friar for Sasha, with Emily as Juliet's stylish nurse) and act out a few scenes opposite the dancers. This works best when it's just a line or two, to place the scene within the context of the familiar story, such as "my only love sprung from my only hate" or "Tybalt is gone and Romeo banished" as we flow from one dance to the next. But the longer speeches and lengthy dialogue scenes, although well performed by the two talented actor/singers, drag down the momentum of the piece. I would love to see them go all the way with the concept and tell the story strictly through dance with little to no dialogue. As it is it's a bit of an awkward mix of traditional Shakespeare and contemporary jazz dance that sometimes works and sometimes doesn't. Another complication is that at the preview I attended, the amplification of the singers was too loud and somehow muffled, so hopefully they'll work out the sound mix as they go along. various scenes: "Poker Face" for the masquerade ball, "Bad" when Romeo and Juliet's friends are discouraging their love affair, "Rolling in the Deep" for the rumble, I mean fight, scene, and "Angel" for Juliet's faux death. Similarly, the choreography beautifully expresses the anger, love, excitement, or grief the characters are feeling. I especially loved the fight scenes, the party scene, and the power of the percussive dances with little or no musical accompaniment. The talented company of dancers is led by Patrick Jeffery and Julie Hatlestad as the charming star-crossed lovers. While COLLIDE's previous two productions have been at the Southern Theater, the Lab is a great place for dance too. Plenty of space for movement, with stairs leading to the requisite balcony, underneath which the musicians are perched. The modern costumes range from graphic black and white for the gang fights to colorful dresses and shirts for the ball. My third COLLIDE production and I finally get where the title comes from - the collision of multiple art forms including dance, theater, and music. Romeo and Juliet truly is a beautiful and inventive creation of music-theater-dance, even if it doesn't all quite work. Playing now through April 20 (a few discount tickets still remaining on Goldstar).